Earlier in the year I ran across a pre-order for an item I’d wanted for a while – a Dragonball Z Saiyan Space Pod. Irwin Toys put one out in their 90s/00s run and it could have worked with S.H. Figuarts figures, but it stayed pricey on eBay and was a little small. This new one is a 3rd Party item, just titled Space Pod, by a company called Dragon Summon. It’s 1/12 scale so it works well with Dragonball S.H. Figuarts figures, features a base and lights that rotate between 7 colors. Construction is on point using a hard plastic throughout. It’s a simple offering other than the lights and they nailed it, does the job perfectly. We’ve run it through it’s paces, read on to check out over 30 images of the Dragon Summon Space Pod courtesy of site sponsor The Toy Source! Related Toy Source Links: Dragon Summon Space Pod, S.H. Figuarts Whis, Super Saiyan Trunks, S.H. 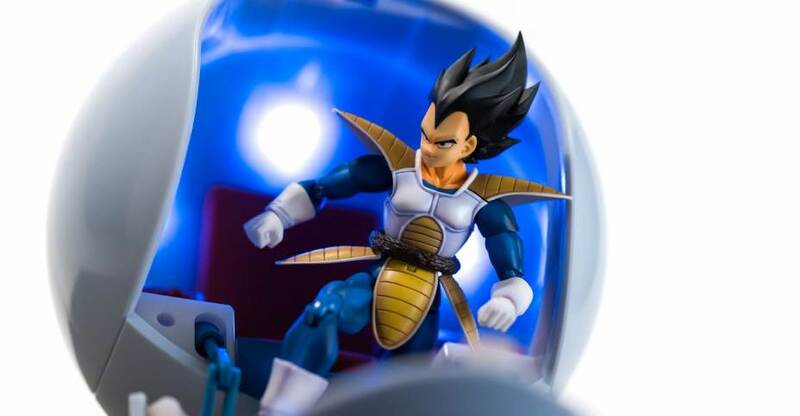 Figuarts SSGSS Vegeta, S.H. Figuarts Beerus, S.H. Figuarts Premium Trunks, All SHF DBZ.